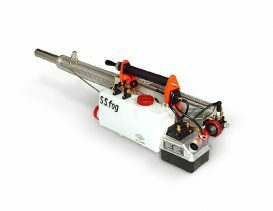 Sprayers thermal fogger many manufacturing companies in the world. However, considering the overall factors of quality, efficiency and cost of the machine its SS-150F machines Seshin is more appropriate. The machine is equipped for professional users in the control of pests. Chemicals and oil emulsion combustion engine will be fired into the smoke, can work very well in dealing with insects in warehouses, barns, gardens, drains, … The machine is used in the work prevention of plant pests, such as pine plantations, forest recovery, ..
+ Dry Weight: 9 kg. + Chemical storage tank capacity: 6.5 liters. + Petrol tank capacity: 1.5 liters. + Level of fuel consumption: 2 liters / hour. + Fuel tank pressure: 0.08 kg / cm2. + Chemical tank pressure: 0.3 kg / cm2. Spray + Speed: 50 liters / hour.